Under Arizona law, it’s unlawful to enter a property, or remain on a property after a reasonable request to leave. The person requesting the other to leave must have legal authority to make the request. It’s also unlawful to enter upon a property where there’s a reasonable notice prohibiting entry, such as a conspicuous “no trespassing” sign. Entering or remaining on rail road tracks, storage yards, switching yards, or rolling stock of a rail road company. 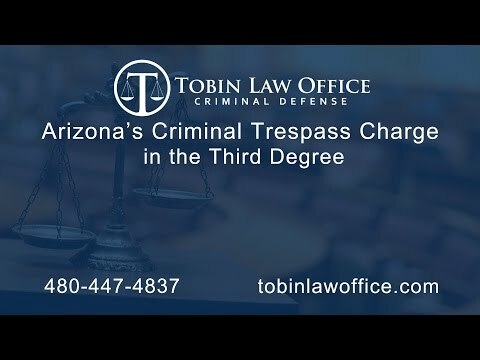 What are the potential penalties for Arizona Criminal Trespass in the Third Degree? Additionally, if the criminal trespass is charged with a domestic violence allegation, a Defendant faces additional penalties, such as mandatory domestic violence classes and the loss of the right to bear arms. Common Defenses to Criminal Trespass in the Third Degree. No Trespass Occurred: False allegations are common. A person reporting trespass may have ulterior motives—this is especially true in a domestic setting. Drugs and alcohol can also play a role in unfair or false accusations of criminal trespass. No entry upon the subject property: Actual physical entry on the property is an essential element of trespass. Snyder v. HSBC Bank (Arizona 2012). Lack of Criminal Intent: In a prosecution for criminal trespass, a Defendant must have acted knowingly. Knowingly means that a person is aware of the conduct and circumstances. Thus, inadvertently setting foot on property of another, or the innocent crossing of another’s property, is not criminal. State ex rel. Purcell v. Superior Court In & For Maricopa County (Arizona 1975). The State must prove, not only that the defendant knowingly and voluntarily entered or remained on the property, but it must also prove that the defendant was aware that his entry or remaining was actually unlawful. State v. Malloy (Arizona 1981). Regardless of the definition of knowingly, the definition of criminal trespass requires that the person knowingly enter or remain unlawfully. Permission: If a person was granted permission to be on the property by someone with lawful authority, or do certain acts on the property, they’re not committing criminal trespass. Licensed, authorized, or privileged presence or conduct on the property: Enter or remain unlawfully, in the context of criminal trespass, means doing so with an intent that is not licensed, authorized or privileged. ARS § 13–1501(1). For example, a home association’s landscaper couldn’t be arrested for trimming the hedges on a resident’s private lawn. That’s because the landscaper is clearly authorized to be there to do his job. No request to leave was made: Before a person can be charged with “remaining upon” property, it’s necessary for there to be a reasonable request to leave. Thereafter, a Defendant would have to refuse to leave. Nunez v. Superior Court In & For Pima County (Arizona 1972). The request to leave was unreasonable: Not every request to leave property is necessarily reasonable; the lawfulness of continuing presence and the reasonableness of a person’s request to leave are issues for the judge or jury. Knox v. Sw. Airlines (9th Cir. 1997). Civil property dispute: The criminal trespass statute cannot be used to resolve civil property disputes. 75 Am. Jur. 2d Trespass § 166 (1991). This is true even when the government is the alleged property owner. A conviction for criminal trespass cannot be upheld if ownership of the property is disputed between the complaining witness and Defendant. Matter of Appeal in Maricopa County, Juvenile Action No. JV (Arizona 1997). Necessity: Sometimes, a person may have to choose the lesser of two evils. Necessity justifies trespass when it’s necessary to preserve life and property. State v. Wright (Arizona App. 1979). For example, if you were being attacked by someone, you would likely be justified in entering private property to protect yourself. That’s because trespass is a lesser evil than the threat of injury. 1st Amendment, Free Speech: Free speech is protected by the 1st and 14th Amendments of the U.S. Constitution; however, free speech isn’t absolute. This defense might apply to protected political speech on certain properties. Constitutional Violations: The right to counsel, Miranda warnings, unlawful searches and seizures, and lack of probable cause or reasonable suspicion are all viable issues that might be raised. Recanting Victim: A recanting victim isn’t a defense; however, it can present a challenge for the prosecutor proving a criminal trespass charge. The prosecutor can still try to force the victim to appear through the personal service of a subpoena. If a victim fails to show up to trial, despite being served, the victim could be charged with contempt.